Whenever you and your Ford model need support, the team at Colin Easson Motors is here to help. Our on-site service centre have state-of-the-art facilities, enabling us to quickly spot, identify and fix any issues with your vehicle. From minor bumps and scratches to full accident repair, bringing your Ford to us guarantees that it’s in the best possible hands. We are able to service and work on ANY make and model of car, please do get in touch to find out more. The Ford technicians at our dealerships have completed full training, and they know each model inside out. We check over every Ford that comes to our service centres with an expert eye, and can pinpoint things you may not even have noticed before they become major problems. All of the work we carry out is completed with only genuine Ford parts and fully approved by the manufacturer. Those parts and accessories can be bought separately from the showroom team whenever you need them. There’s always a large range in stock to fit your Ford like a glove. Our team has built strong relationships with our suppliers and partners, meaning that we can source the best items and parts for you at the best local prices. No matter what services you need from us – or when – you can count on us to work precisely and give you a cost-effective solution. Finance packages, discounts and special offers are all frequently provided to bring you greater value for money, saving you even more over the life of your Ford model. 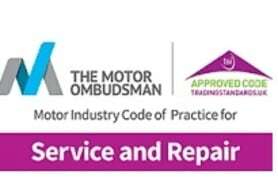 We adhere to the Society of Motor Manufacturers and Traders (SMMT) Code of Practice. 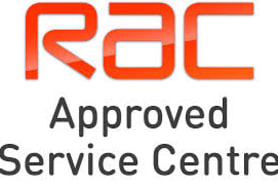 In addition, We Our independently Checked by the RAC Who check the correct practices our being adhered to when your vehicle is being serviced. We are very proud that we have a 100% Pass rate. To maintain that 'new car feeling' your Ford vehicle needs to be regularly serviced in keeping with Ford scheduled service intervals. At Colin Easson Motors our service departments featured Ford trained technicians as well as Ford Master Technicians, Ford OEM parts, and all the latest software and recall updates. What's more a regular main dealer service will help make sure your Ford is running as smoothly as possible keeping fuel efficiency and CO2 emissions within Ford standards and ultimately saving you money on the cost of running your car. As such there's no better reason to have your Ford serviced by the best in the business. All Ford scheduled services include a 30-point FORD eCHECK, a thorough visual inspection by one of our trained technicians to identify anything on your Ford that needs attention . Ford Scheduled Service is available from £150.00.